When I was little, they carried this film at Blockbuster, and I think I noticed it every time I wandered through the Comedy section. But I was then, and have been for my entire life, the sort of person who judges things by their covers. I know I shouldn’t, and I’m not proud of it, but I do. The painted style (which, as an adult, I love) told me the film was old. The man on the box, dressed as Santa, being zapped by Christmas lights told me it was slapsticky. And as a child, I was wary of movies that could be described with both those terms. My father (who I’m surprised never showed this to me) insisted on showing me films and cartoons that were, in his estimation, the best kinds of comedy. His taste ran a little blue, so slapstick was big his living room. But a consequence of his excitement to share these movies with me was that, in his eagerness, he showed them to me when I was too young to appreciate them. If you don’t appreciate cultural context and pop culture references, films like Blazing Saddles and Smokey and the Bandit go way over your head. I learned to associate them with grainy images, saturated in Technicolor, and adults talking at each other with a lot of attitude. Really, I don’t think I realized Blazing Saddles was a film very much worth loving until I was in high school. Point is, I just never took Christmas Vacation home with me from the rental store. Then, in the age of Netflix Instant Streaming (and its contemporaries), I guess it just didn’t come up. I don’t remember who recommended me this film, but I know I thought it was juuust fine. And then, the next year, pre-warmed to it, I liked it a little more. And the next year, I liked it a little more still. This movie does everything right as Christmas films go: it has likable characters, lots of laughs, and a protagonist in the pit of despair who needs the spirit of good will to turn his holiday around. It may have been the pre-gaming, but I think it was mostly the film, that had Jon and I in stitches from start to finish. More than any other time I’ve watched this picture, I was just a mess of laughter and giggles. And it was so nice to hear the other five people in the audience laughing along, often at different gags than us, as if to illustrate how well this movie can service different senses of humor. Indeed it’s a very classic style of comedy that Jon and I were discussing, on our way out, doesn’t really exist anymore in the modern media landscape. The nearest things that can compare are Adam Sandler films, and what a crying shame of a statement that is. It’s also worth pointing out that so much of this film goes above and beyond because of its talented cast. There is not one actor present who does a bad job, and the vast majority of them are excellent, and recognizable if not all household names. Juliette Lewis and a very young Johnny Galecki really sell their roles as the disaffected children of try-hard Clark. The bevvy of actors making up eldest generations of the extended family all deserve due credit for doing a fine job and getting laughs. Of course, Randy Quaid is a standout worthy of many memes and t-shirts as Cousin Eddie. Julia Louis-Dreyfus and Nicholas Guest are pitch-perfect as the next-door yuppie couple who must suffer the Griswolds. 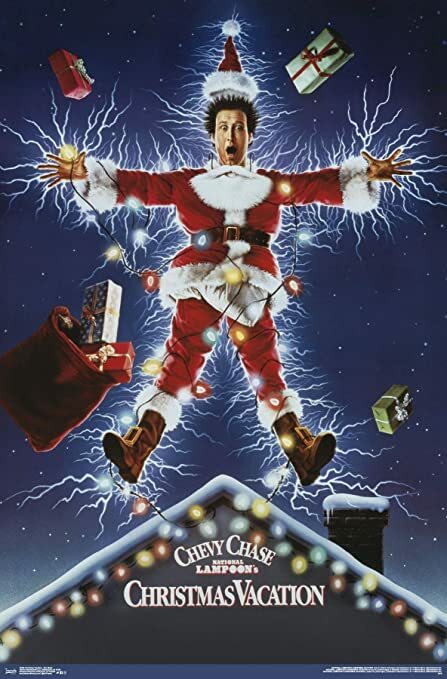 Chevy Chase, though a ratshit person, is among the only people on earth who could have done this role well. But to me, the real standout, the one I can’t take my eyes off of and not just because she is gorgeous, is Beverly D’Angelo as Ellen, the household matriarch. There is a sort of running gag where she will be wedged or frozen in this or that position, and her great, big eyes will dart here and there with impeccable comedic timing, selling the gag, and indeed the scene, like no one else in this movie can. It’s just something about her face and the way she carries herself. She is the loving, supportive mother and wife of an idiot, but she is also clearly the only person besides her children with a healthy amount of self-awareness about her life and what’s going on around her, and she enriches every scene by bringing that weight to it through her character. 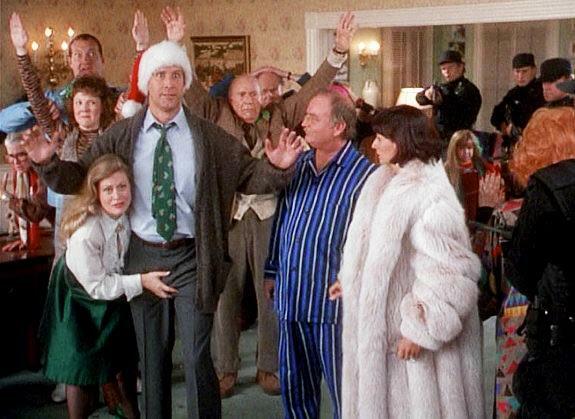 Christmas Vacation is up on the same level as A Christmas Story and It’s A Wonderful Life for me. It wasn’t always, but it is now. It is an unmissable holiday classic, a product of its day, which could not be replicated by any other production operation, cast, or pop cultural zeitgeist. It’s a special little treasure of a movie, at once unassuming and also very ambitious. It’s Good and, on the GBU Christmas-Adapted Rating Scale, an unassailable ★★★★★.